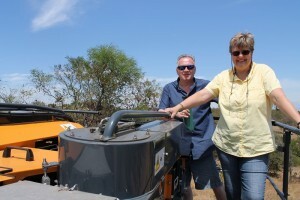 We had the opportunity to meet many South African Wine people during our February 2016 trip. One of the days Roy and Dianne brought us to Zevenwacht Wine Estate for a tour with winemaker Jacques Viljoen the following lunch at the estate. 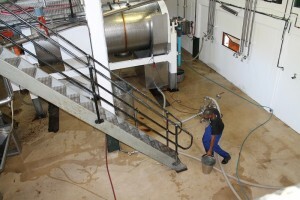 Jacque started at Zevenwacht Wine Estate in 2002 as the assistant winemaker. 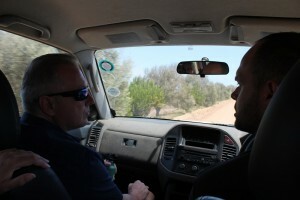 He became winemaker and cellar master in 2005 and has been in charge ever since. 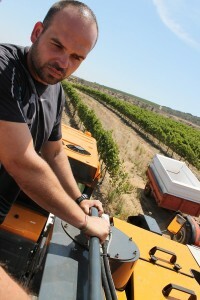 Jacque on a mechanical harvester. 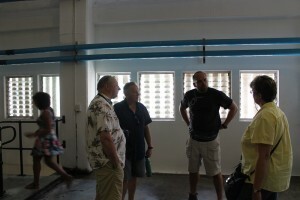 The first part of our visit was a tour of the winery and cellar. They were right in the middle of harvest. Many trucks were dropping of fruit as we toured the facility. 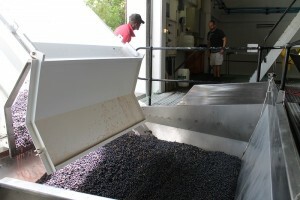 The Syrah fruit was destemmed, crushed and chilled. The large tank by the stairs is a press. 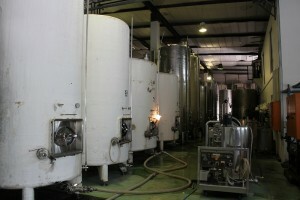 The tanks to the right are for fermentation and storage. Why was it chilled? As the day progressed the temperature was rising. They need to chill the fruit to not allow fermentation and allow any spoilage bacteria or yeast to start too. After a couple of days chilled the fruit would be slightly warmed up and yeast including nutrients would be added. 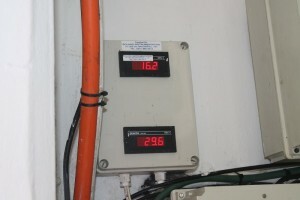 The top number (16.2°C or 61°F) is the temperature after the must is chilled. The bottom (29.6° or 85°) is the prechilled number. Jacques first stop was in the Syrah vineyard. They have a mechanical harvester. The machine is quite elegant. After seeing the machine in action, I can say there are no issues about mixing grapes with MOG (Material Other than Grapes). There are rolling spindles that only allow ripe fruit to enter the machine. 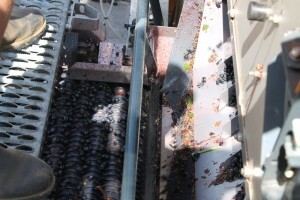 The rest of the grapes and other materials (stems, leaves, bird nests, etc) are pushed off the side of the harvester. You can see the spindles in front of the boots. MOG cannot enter between the rollers into the small openings. Hard and large items are pushed out the side. The other advantage is it requires less labor and can run twenty-four hours a day. With physical labor, they had issues with people showing up and missing pruners at the end of the shift. 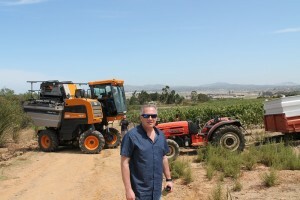 It was time to drive to the top of the estate to visit the 360° Sauvignon Blanc Vineyard. 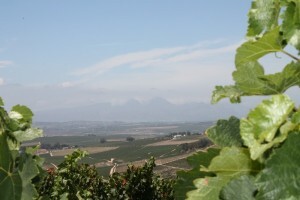 The vineyard is south-facing and elevated 340 meters above sea level, the 15-year-old vines look out over False Bay and are planted on the coolest site on the farm. The soil is mainly decomposed granite with clay subsoil helping to buffer the vines during stress. 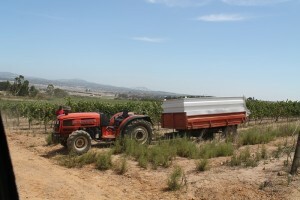 The grapes from this site derive the full benefit from the cool sea breeze during the slow ripening stages. Pungency, aroma and full concentration are the hallmarks of this fine Sauvignon Blanc. There is no shortage of these varietal characteristics on these lofty southern slopes. 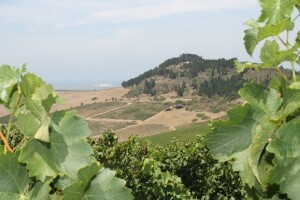 A grapes eye view atop of the 360° Sauvignon Blanc Vineyard. 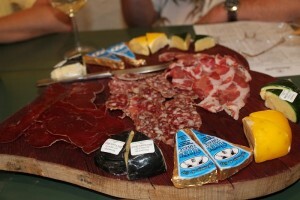 Our tour ended with a tasting with Jacque which included a cheese platter. 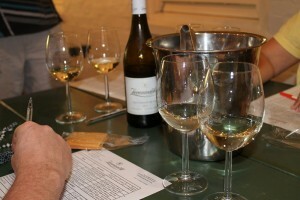 We tasted all of the Flagship wines and the Z Wine 360° Sauvignon Blanc. Here is a breakout of the Flagship wines. 2013 Cabernet Sauvignon – 2 glasses. It tasted green, smokey, oaky. The fruit was under-ripe in my opinion. After the tasting, we had a wonderful late lunch at the Zevenwacht restaurant. Three of us had a fish meal and the fourth was calamari. The food was excellent. The weather beautiful. Overall a spectacular day in Stellenbosch South Africa.